I arrived at Birmingham University to discover that I wasn’t quite as good a skier as I had thought. I made the ‘B’ Team in my first year, racing in Alpe d’Huez and quickly became involved in the ski club. 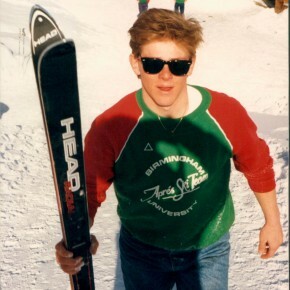 By the second year, I was on the committee and effectively running my first ski business. We were the biggest sports club in the Athletic Union. We produced – see left – ‘stylish’ club sweatshirts (no such thing as hoodys in those days). We also took a few hundred students on two trips each year. Committee members, of course, travelled free of charge.